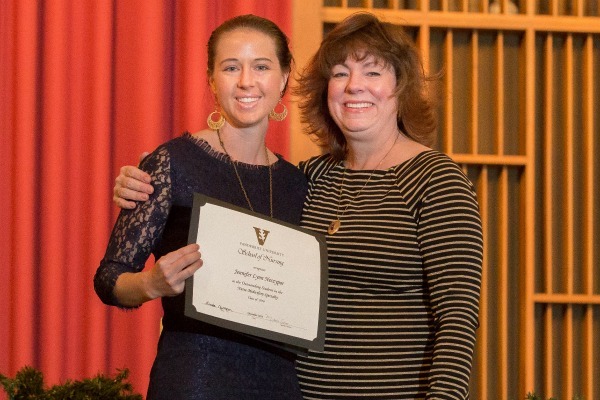 Nine nurses from Vanderbilt University School of Nursing and Vanderbilt University Medical Center recently received top honors at the March of Dimes Tennessee Chapter Nurse of the Year Awards. The event, in its ninth year, recognizes nurses who embody leadership, compassion and excellence in patient care across nursing specialties. VUSN Dean Linda Norman, DSN, RN, FAAN, the Valere Potter Menefee Professor in Nursing, complimented the winners on their accomplishments. The event was chaired by Kathie Krause, MSN’92, RN, NNP-BC, NEA-BC, chief nursing officer for Monroe Carell Jr. Children’s Hospital at Vanderbilt. Award recipients were determined by a selection committee comprised of nursing professionals who screened the nominations. The winners were chosen from nurse nominees who represent the March of Dimes’ vision for a healthier, stronger generation of babies and families.